A bridge is a fixed solution to replace one or more missing teeth. Bridges utilise an existing tooth/teeth adjacent to the space to hold an additional replacement tooth in the gap. Adhesive bridges – These bridges can be used when the tooth/teeth that will be used to hold the bridge are either unfilled or have very small fillings on them. 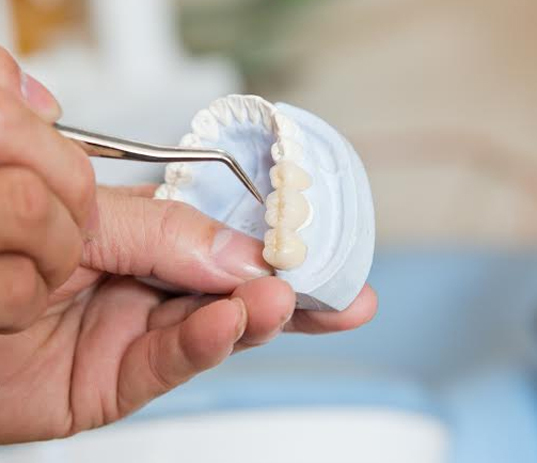 The holding tooth will require very little preparation and therefore these are the most conservative of bridges. They are usually used to replace single teeth. Conventional bridges – These can be used to replace larger spaces and when the holding tooth/teeth are heavily filled. They require preparation of the holding teeth. Bridges can be constructed from porcelain, non-precious metals, gold or a combination of materials. We will discuss the most appropriate type and material of bridge with you at the assessment appointment. You will need an appointment where the tooth/teeth are prepared as necessary and an impression taken. The impressions are then sent to one of the highly skilled dental technicians that we work with, who will construct the bridge. A temporary bridge is usually made during the appointment so you do not have a space whilst your bridge is being made. You will then need to return to have the temporary bridge removed and your final bridge fitted. Sometimes extra appointments are required, especially if you have complex bite. We will show you how to care for your bridge and clean around it so that it can last a long time. It is important that the teeth and gums supporting the bridge are kept clean and strong to form a solid foundation for the replacement tooth/teeth. Careful cleaning with interdental brushes and superfloss as well as a low sugar diet will ensure a successful bridge in the long term. The bridge will last a number of years as long as it is cared for well. With good oral hygiene and diet it could last up to ten years or more.